This trimmer comes in a nice blue package that actually complements its color scheme. It will capture your eye right out of the box with its ergonomic design and rubber/plastic body. Besides impressive aesthetics, the BT526033 trimmer has a lot more to offer. Check out this Philips Series 5000 adjustable beard trimmer BT5260/33 review and discover what else this model has in store for you. UPDATE: UNFORTUNATELY THIS MODEL IS NO LONGER ON THE MARKET. WE RECOMMEND YOU READ OUR REVIEW FOR THE PHILIPS BT5200/13 BEARD TRIMMER WHICH IS CLOSE TO THIS ONE. Maybe you’re thinking about keeping your fresh stubble look by shaving excess facial hair every couple of weeks… or perhaps you’re looking to maintain a 10mm beard. Whatever your preferences, and even if your preferred beard length is somewhere in between those lengths, you can easily achieve the look you want with the adjustable comb that comes with the BT5260/33. This Philips beard trimmer adjusts cutting lengths from 0.4mm to 10mm. In total, there are 17 length settings to choose from, and you can lock into each one with a simple turn of the zoom wheel for accurate precision and control. Increments depend on what range your desired length falls in. For instance, if you’re aiming for anywhere between 0.4mm and 1mm, you can go up or down in 0.2mm steps. From 1mm to 5mm, you can make 0.5mm increments. And finally, a cutting length of 5mm to 10mm allows for 1mm adjustments. Furthermore, removing the adjustable beard comb lets you transition effortlessly from trimming to detailing or shaving all hair for a skin-tight trim. Without the comb, you can use the double-sided reversible trimmer head. On one end, it offers a 32mm wide blade that’s perfect for cutting fine lines around your side burns. Turn the reversible head around and you can use the 15mm wide blade. The smaller cutting side comes in handy when getting into small spaces like underneath your nose or around the mustache and mouth area. Another feature that you’ll love about the Philips series 5000 beard trimmer is that it will not irritate your skin. The blades feature rounded tips and combs to eliminate skin irritation. They also remain sharp at all times by brushing lightly against each other. The Series 5000 Philips trimmer offers you convenience when it comes to operation. You can use it directly from a wall socket or charge the battery to get up to 60minutes of cordless use. In case battery power ends in the middle of trim, just plug it back into a power source. Like most Philips trimmers, the BT526033 model doesn’t need to be re-oiled. This means you can enjoy the convenience of owning a low-maintenance beard trimmer. And when it comes to cleaning, just rinse the blades under tap water then let them dry. 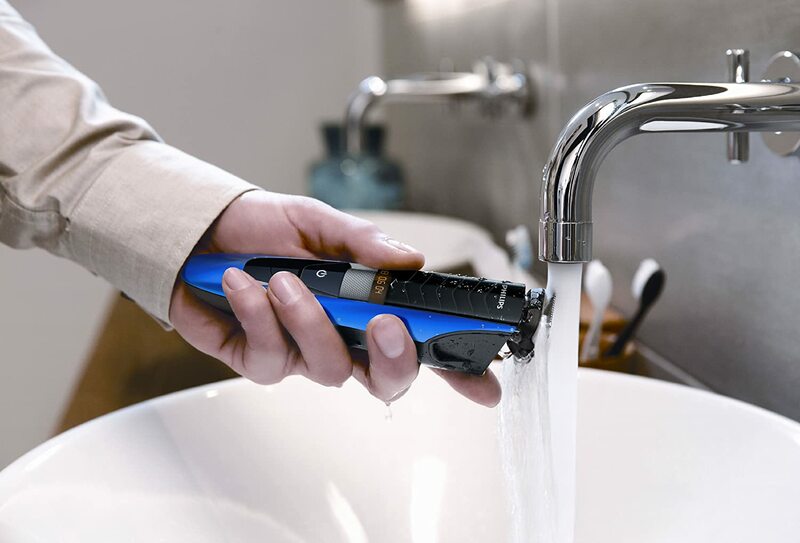 The trimmer is 100% waterproof, which makes cleaning off hair clippings much easier than using a brush. On Amazon alone, buyers have so far given this trimmer a 4 star rating out of 5. This is an impressive rating considering that there has been over 200 reviews for the beard trimmer at the time of this writing. If you’re looking for a beard trimmer that can maintain facial hair growth that ranges between 0.4mm to 10mm, then the Series 5000 BT526033 model from Philips is worth considering. From a clean-shaven look to a short stubble or full beard, this trimmer gets the job done at an affordable price. It also makes trimming hassle-free and convenient with a host of useful features. Buyers within any European Union country should be glad to know that the trimmer comes with a 1-year warranty on repairs.